After polling my extended family about my passport photo, the general consensus was that I should get it retaken. My family thinks that looking like a terrorist in a State Department document is an invitation for trouble, and they're probably right. I think any potential terrorist connotation is muted by the superimposed graphics and the bizarre magenta facial shift. Then again, so what if it isn't? What if I do look like a terrorist? The thing is, as a street photographer I'm used to being viewed with suspicion. Aiming a Leica in certain directions is a bit like wearing a Kafiyeh or dreadlocks. You're going to get hassled by authorities, period. Hopefully this will change eventually but for now it's reality. So when it comes to an airport or border crossing, it's just like a sidewalk. I expect to be stared at, questioned, and asked for ID. And so long as I'm going to be treated like a potential terrorist I figure I may as well look the part. 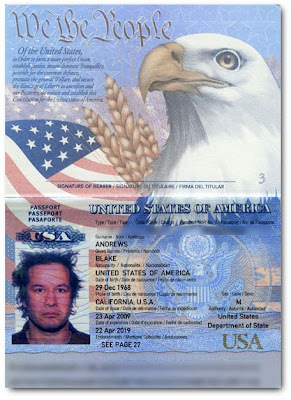 I'm curious to try the passport in a real life situation, perhaps while holding a camera and with long hair. The next time I cross an international border I'll post an update. 4/29/09 Addendum: From Bryan Wolf in Portland comes this passport. 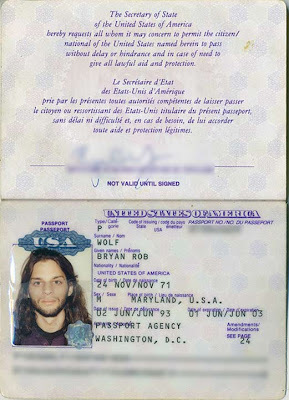 A self described "long haired photographer who looked like a textbook drug smuggler," Bryan says he's been hassled at borders but due more to his appearance than his passport. I see lots of potential to stash Communist leaflets or nuclear blueprints in that thick beard and hair. Even so, he reports his camera gives him more trouble with authorities nowadays than the long locks. Lukas Vasilikos: What Was He Thinking? Cary Conover: What Was He Thinking?